As I listen to your Hymnworks, I find myself worshipping the Lord. Thank you for your commitment to Him, and for the touch of genius He gave you in linking our loved old hymns with the classics. I am richer because of you! Linda McKechnie brings her honesty, her humor and love of her Lord to every audience she meets. You will be charmed by her warmth and be inspired by the grace of her music note by note by note. Linda McKechnie’s music weaves the story of God’s redemption, love and joy. 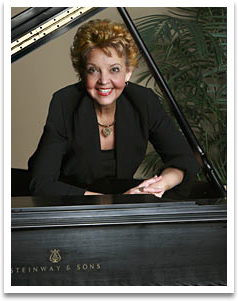 Incorporating familiar hymns from her gospel roots and classical themes from her music education, this talented pianist fills our hearts with songs of God. "To God be the glory" is the theme of Linda’s music-and the theme of her life. As she tells her story , we see how God has interwoven His gifts in her life to create something beautiful for Him. Listen to her music, hear her witness, join her in song. Linda will lead you in finding the song in your life and praising God that in His hands there is harmony. To say you are an inspiration to me is a major understatement! Because of your thrilling arrangements, I was compelled to get back into piano lessons just to play your music. That pursuit afforded me not only the reward of accomplishment but created many enjoyable hours... just me and my piano.... a kind of quiet time or "retreat". My mother, age 74, was spending the weekend with me and came down with a bad virus. She was extremely ill and was so nervous about getting dehydrated that she wanted to be hospitalized. I turned on your tape and left her to rest. Later, she asked where the beautiful music was coming from and that, for a while, she thought the angels were playing it in Heaven! She was convinced the Lord healed her through your music and I was too. Your music holds special memories for me. While expecting our first child, Ray and I attended your concert performance. I will never forget the movement of my baby in me while being engulfed by your music. The joy was almost more than I could bear. Sarah, who is now three years old, loves music. I believe it must have begun before her birth while being exposed to your music during live performances and tapes. Here I sit in church listening to you play...failing to sing words because of emotion in my throat and gratitude in my heart. I could feel Jesus’ presence here and I imagined Him sitting beside you on your bench- gently whispering once again..."Well done, my good and faithful servant". There are not enough superlatives to describe the experience of having Linda as a guest artist. Not only is she a lovely, gifted and talented person. She is also the epitome of graciousness and flexibility which can indeed be rare in the world of "celebrity status". Linda has done what most arrangers have always attempted to do - share their faith through music, a language without words, without preaching, but still conveying the very presence, power and majesty of God. God is good. One of His greatest blessings to me in 1997 was the joy of sitting under your anointed ministry in worship and music at the concert Friday night...It is not often that I have a worship experience that is as God-honoring, uplifting and awe inspiring as that. I didn’t want to see the concert/service end. What I saw demonstrated is much more than talent. It is super-human, supernatural, a spiritual gift from God that enables you to hear from Him and put music together in the tremendous way you do... What you do definitely has its source in Heaven. Thank you for your good work and witness this past weekend. I appreciate your compassion and individual attention to several handbell ringers. You were equally a real blessing as you shared your music in our worship services. I have had numerous comments and cards relating how beautiful and uplifting your playing was. festival. The participants from the handbell workshop commented that they especially appreciated getting to know you as a person, as well as the composer/arranger of the published music we rehearsed. Your talent and winsome spirit was obvious.